The Wexner Center has long been the best-sounding room in Columbus, particularly well-suited for jazz. This Fall, the OSU campus institution is bringing one of the most robust jazz lineups in years to its performance space’s intimate quarters. That series explodes right out of the gate on Saturday, October 3rd, at 8:00pm with Linda Oh‘s Sun Pictures quartet featuring Oh’s riveting compositions and astonishing bass playing accompanied by three of the finest young jazz players on the NYC scene: Ben Wendel on saxophone, Adam Cruz on drums, and Matt Stevens on guitar. Visit here for tickets and more information. Read on for more information on Oh and the other members of her quartet and videos. Upon moving to the states from Australia, Oh quickly established herself as a top flight bass player and a first call for many of the finest performers working today. 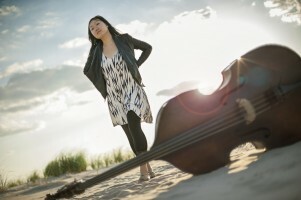 This brought her to attention most prominently with Dave Douglas, her new label head, holding down the rhythm in his new quintet alongside Rudy Royston on drums and Matt Mitchell on piano as well as the bass chair in his all-star Wayne Shorter homage project Sound Prints with Joe Lovano (where local fans first encountered her live in 2013). She’s also provided clutch support to talents as diverse as saxophonists Greg Osby, Jon Irabagon, and Sarah Manning, singer Melissa Stylianou, and drummer Teri Lyne Carrington. Parallel to this, she quietly refined her work as a composer and bandleader over a series of records under her name. Her unique voice came to full flower on her most recent record as leader to date, 2012’s Sun Pictures. It’s full, almost to bursting, with rich harmonies that thorny and lush at the same time. She deeply understands the instruments in this quartet and both uses their natural resonances and the boundaries of their natural ranges. She plays with juxtaposition and shifting rhythms in a way that’s catchy and bracing to the ear. What I find most exciting about these compositions is the way Oh’s writing uses repetitive, deceptively simple, almost folk song forms that slyly shift and reveal their variations and complexity and beauty over time. The melodies get their hooks in a listener’s head and explode on a delay. Ben Wendel, in the saxophone chair for Sun Pictures, is one of the most exciting reed players working today. He’s got a tone that can go from sweet to excoriating on the turn of a dime, immediately recognizable and hard to forget. Wendel – in addition to his own records, most notably the fantastic duets album Seasons – has enriched and enlivened records for pianist Dan Tepfer, bassist Todd Sickafoose, and the Dakah Hip-Hop Orchestra. But what Wendel’s best known for, and rightly so, is the collaborative band Kneebody. We’ll discuss Kneebody more in our article about their collaborative appearance with Daedalus in November, but for now let me just say it was the most riotous, enthusiastic audience I saw in two days of cramped rooms and mind-blowing performances at Winter Jazzfest in 2013. Guitarist Matt Stevens’ star has been consistently rising in the NYC jazz scene for his percussive, melodic sound that recalls indie rock’s jittery rhythms as well as a history of jazz guitar that most often recalls, for me, John McLaughlin’s ’70s wrok. The buzz reached a fever pitch with his record Woodwork released earlier this year which features Gerald Clayton on piano. Drummer Adam Cruz comes out of the Art Blakey school but with a hip, modern feel that encompasses many many modes. Cruz has an unerring feel for the emotional heart of the piece and his telepathy with Oh is jaw-dropping.